MONTREAL -- The so-called Trump effect is real when it comes to Canadian universities and Ottawa needs to take full advantage by making immigration easier, Concordia University's president said Wednesday. In a speech to the Montreal Council on Foreign Relations, Alan Shepard said a wave of "regressive nationalism" has manifested itself in parts of the western world, leading students and academics to consider relocating to Canada. "I am deeply surprised by what's happening in the U.S.," he told reporters after his speech. "I grew up there and spent my first 40 years there and it's pretty difficult to watch." He said the process for moving to Canada is unnecessarily complicated and that government needs to make it easier in order to take full advantage of the increased international interest. Shepard said he had to hire a lawyer in order to complete his own immigration application to Canada from the United States. "I have a doctorate and I found it difficult," he said. "It shouldn't be that hard. In societies where you're really magnets for talent -- as we are -- you want to make the doors wide open." The election of Donald Trump and the ensuing political climate have sparked what is being called the "Trump effect," as people around the world reconsider moving to America. Besides increased interest from international students for Canadian universities, high-tech workers are also looking more to Canada, according to the New York Times. "Canada stands to benefit from the American political climate," the newspaper reported on Tuesday, with regard to attracting top talent in fields such as artificial intelligence. Claims about the Trump effect aren't just anecdotal. Universities are reporting data that backs it up. Since May 2016, U.S. applications for undergraduate studies at Concordia have increased by 23 per cent and by 74 per cent for graduate classes. Undergraduate applications from Mexico have jumped 325 per cent and by 233 per cent from India during the same period. The Trump effect is real across many universities, Shepard said, adding "that's what I'm hearing from my colleagues across Canada." 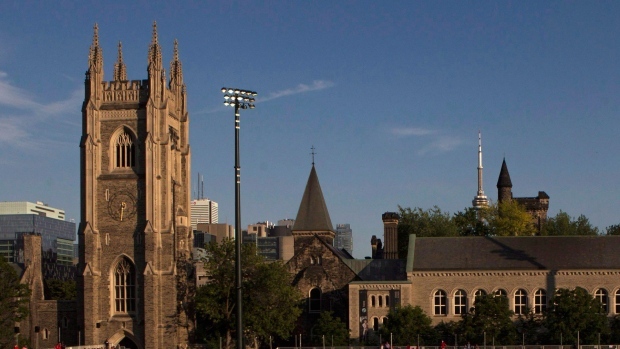 University of Toronto spokeswoman Larysa Woloszansky said in an email the school has received 22 per cent more international applications for the coming school year compared with the current one. "The number of U.S. students who've accepted (admission offers) has increased by 104 per cent compared with (the admission process from) last year," she said. "The number of students from India has increased by 75 per cent." Trump's attempts to temporarily ban people from several Muslim-majority countries has created a perception around the world the United States is not as welcoming as it once was, Shepard said. Richard Levin, executive director of enrolment at the University of Toronto, said data from his school "certainly show an increased interest from international students -- and the U.S. in particular." Levin said that when it comes to student immigration, the process is "pretty good." Recent changes allowing international graduates to stay in the country for up to three years is popular, as are changes making it easier for graduates to obtain permanent residency status. "The prospect of longer-term engagement with Canada is attractive to international students," Levin said.